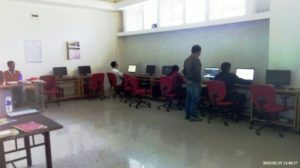 College of Agricultural Engineering and Post Harvest Technology (CAEPHT) Computer Laboratory provides 20 new computers for computing facilities to the all Students of College, Teaching and non-Teaching staff along with internet connectivity. It also provides Internet facilities to all teaching staff, administrative staff and all Students of the College. There are nearly 300+ users which are using internet facilities and computing facilities. Computer Centre supports a wide 1000 MBPS fiber optic network that connects all the academic units, hostels, library, Residence and other central facilities to the Computer Centre. Users can use the computing resources of Computer Center from their offices, Academics Unit, Hostels and Residence. Login is provided to all the students, faculty and staff members for browsing Internet. Wi-Fi Facilities are provided to Boys Hostel, Girls Hostel, ATIC Building, Guest House, VC Camp, and Dean Residence. LAN is provided through Optical Fiber connection in North Academic Building, South Academic Building, New Girls Hostel, Auditorium, Residential Quarter, Medical Unit and Farmers Produce Organization Building. The network Security is Provided through UTM/Firewall. Computer Center maintains College website (http://www.caephtcau.ac.in). The College website is updated by this Centre from time to time. The Information on the website is displayed after the approval of the Dean, or administrative offices. There are total 20 nos of computer for Practical Lab.